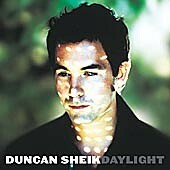 It’s hard to believe that six years have passed since Duncan Sheik burst onto the pop scene with the irresistible radio hit Barely Breathing. Even better, his self-titled debut album was a promising one that mixed and matched the sounds and styles of Donovan, Jeff Buckley, and Nick Drake. Indeed, it appeared as if Sheik might just rescue adult contemporary pop from its tired ennui. Since then, Sheik’s career has taken a turn towards mediocrity, a path that he continues to traverse on his fourth effort Daylight. For the record, the album is a musically elaborate outing, full of lush orchestrations and arrangements that lovingly paint Sheik’s ambient acoustic ballads with weary, melancholic colors. Occasionally, there are wisps of electric guitar, organ, and percussion that break through the darkness, injecting some much needed illumination on his forever yearning lyrics. For the most part, however, the album wears its cloak of grey to the point of becoming monotonous. It’s only towards the end of Daylight — with the trilogy of Good Morning!, Memento, and Shine Inside — that Sheik shows a spark of life and even begins to fulfill the promise and potential of his debut. Daylight is available from Barnes & Noble.